American guitarist John Pizzarelli, a chip off the old block, and Egyptian guitarist Ahmed el-Gebali: What do they have in common? Cairo native Diaa Bekheet has worked for a host of media outlets, including Radio Cairo in English, ETV News, Deutsche Presse-Agentur and the Associated Press. 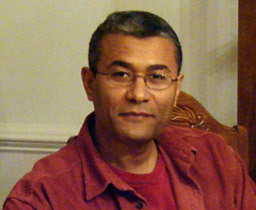 He joined VOA in Feb. 1989, hosting a variety of popular news and entertainment shows for the former Arabic Service such as Radio Ride Across America, Business Week, and Jazz Club USA. He has interviewed a number of Jazz celebrities, including the legendary Dizzy Gillespie. Diaa is currently an editor for our main English site, VOAnews.com.